Whether if you’re a target archer, bowhunter, or both, your archery sight is one of the most important accessories on your bow. 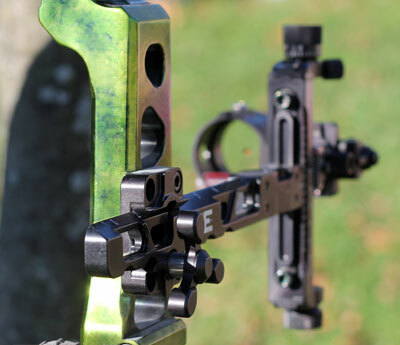 There are a wide variety of archery sights on the market and clearly they are not all created equal. Differences in components, build, quality and adjustability are some of the factors that separate the best sights from the rest of the field. One thing is for sure; you get what you pay for. 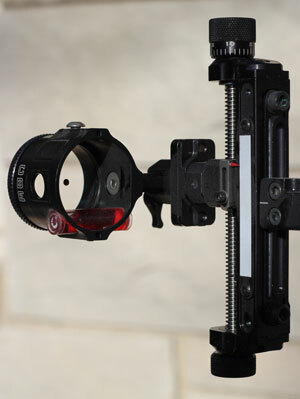 CBE Sights are some of the best on the market and today we are going to look at the CBE Vertex Target Sight. The build of an archery sight is really important to serious archers. When a sight is of a high quality, rock solid build, some will say “you can pound nails with this sight.” This is the case with the CBE Vertex Target Sight. The sight is made out of high strength aluminum and has a nice black anodized finish. The dovetailed extension bar, windage unit, and elevation adjustment unit all have laser engraved markings for reliable references during the life of the sight. The dovetailed extension bar is extendable out to 8 inches allowing the shooter to find that sweet spot for both clarity and stability. The locking screw system along with the laser etched marks provide effortless removal and reinstallation of the sight. 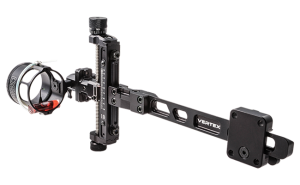 The CBE Vertex Target sight offers 1st, 2nd, and 3rd axis adjustments via screws located on the extension arm to ensure your sight is calibrated to your bow. This is essential for accuracy while taking uphill and downhill shots on the course. Reference CBE’s included instructions to complete these adjustments. 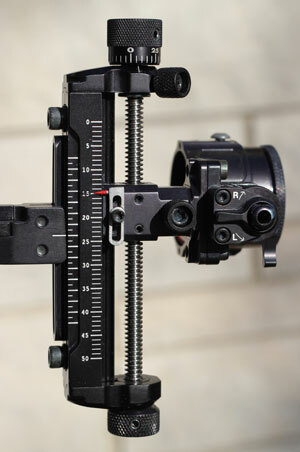 Adjusting the elevation of this sight is effortless and solid. After loosening the locking screw (1) simply turn the adjustment knob (2) for a micro click adjustment, then retighten the locking screw. This micro click adjustment along with provided laser engraved sight scales will give you dependability while at a shoot under any weather conditions. 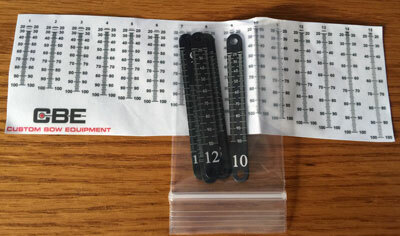 To choose the proper sight scale, simply use CBE’s sight tape gauge tool. To use the tool, all you do is mark on a blank tape where your 30 and 60 yard marks are. Using the sight tape gauge, line up your 30 yard mark with the gauge’s 30 yard mark and then look to see where your 60 yard mark is. Wherever your 60 yard mark is on the gauge will tell you the tape number you should use. The elevation can be adjust a full 3 inches ensuring you’ll be covered for extremely long distance shooting. Adjusting windage is very easy. Simply loosen the locking mechanism (1) and turn the adjustment knob (2). 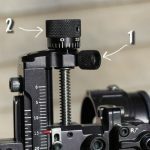 The micro adjustment knob will deliver clicks as the sight is adjusted left and right. L and R are engraved on the housing for guiding your adjustments left and right. After adjusting, tighten the locking mechanism and fire away. 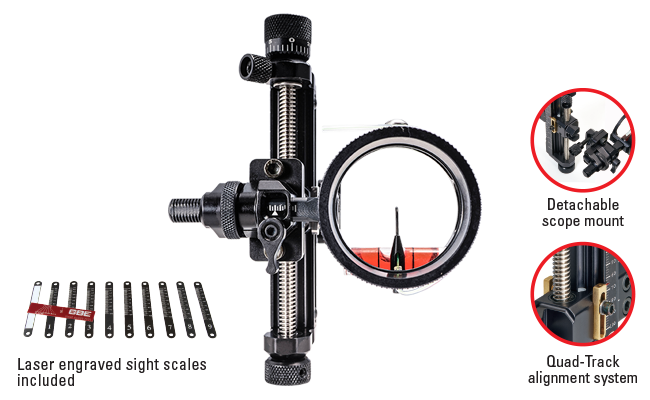 The CBE Vertex Target Sight comes with the above mentioned sight tape gauge, 15 laser engraved sight scales and 15 self adhesive sight tapes. 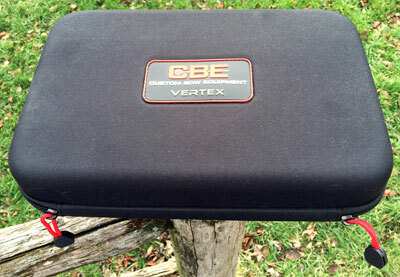 The CBE Vertex Target Sight also comes with a very nice zippable carrying case for safe storage and transport of the sight. 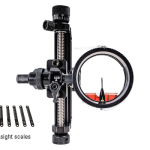 CBE offers scopes and lenses for the CBE Vertex Target Sight. You can choose from 1 3/8″ or 1 5/8″ diameter vented or non-vented scope housings. Their Acuate Lenses, made by Feather Vision, offer 99.5% light transmission and are available in 2x, 3x, 4x, 5x, 6x, and 8x powers. If you choose to shoot a pin with your scope/sight, CBE offers their Rhino pin which are ultra-fine steel pins offered in sizes 0.010, 0.019 and 0.029.
sight tapes and sight gauge were a very nice time saving bonus that eliminated the need for archery software to obtain tapes. The carrying case is of high quality and definitely will protect your investment while in transport. The scope is of high quality and was easy to setup except of one thing; the mounting hole. On all three of our scopes, we had to mill the scoped mounting hole a hair larger in order for the mounting screw to pass through. Although this was easy for us to do, it was an inconvenience and hopefully has been addressed by CBE. The lenses and pins from CBE were great and somewhat easy to install. The pins, due to their size, come with very small hardware so extra care should be used during installation. If you are in the market for a quality target sight for competitive shooting, we suggest you check out the CBE Vertex Target Sight. Visit CBE’s website for more information. Other than the scope mounting hole issue we encountered, the CBE Vertex Target Sight, scope, lens, and pin were easy to install. The sight is their flagship sight and for good reason. It’s rock solid in design and really easy to adjust. We suggest trying this sight. Shawn is a seasoned veteran in the woods and on the water. Shawn has bagged numerous Boone and Crockett whitetail deer, elk, a wolf, a mountain lion, and mule deer just to name a few. Shawn’s main goal these days is to help his son Cole become a respectful and accomplished hunter and to help out others on shootingtime.com.